A belief is an explanation for why things seem to happen that we accept as true. A belief is different from a judgement, which involves consciously evaluating a proposition for its truth. If the conclusion is that it is true, judgement may lead to forming a belief. 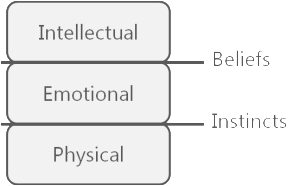 The belief acts as a representation of how part of the world works and therefore influence the actions we take in this world. 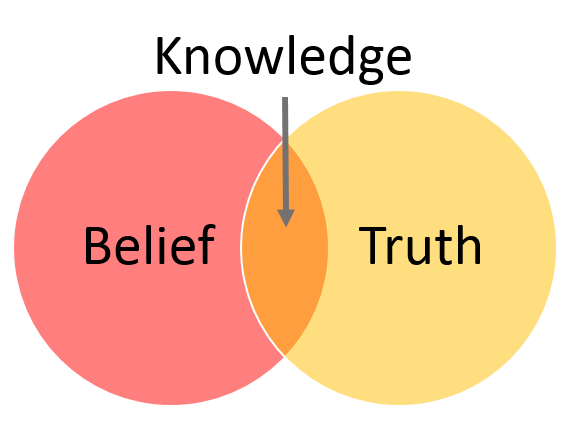 If you believe something is true, you must be willing to act accordingly- otherwise you can’t claim belief . Beliefs drive all our behavior, including how we react to the behavior of others (driven by their own beliefs). Existence. One of the most basic beliefs, that something actually exists. Association. We use reference to things to understand another, stating something is like something else in some aspect. Equivalence. Believing two things are the same, often ignoring differences and leading to incorrect generalizations. Enaction. Things happen like change and the flow of time. Causation. The belief that one thing causes another thing, sometimes accepting a false correlation of events. Religion and Philosophy are belief systems that guide how we should behave- they are more internally focused. 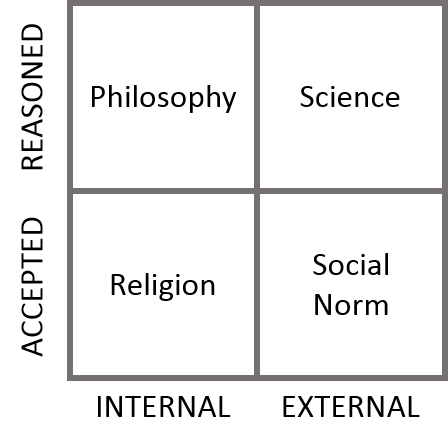 Religious beliefs are associated with faith while reason plays are stronger role in philosophical belief. We tend to accept the beliefs of the society in which we live, often without much thought since we are exposed to such beliefs long before we have developed a capacity to reason. The profound influence of science is due to its systematic search for knowledge (truth intersecting with belief). Science minimizes faith while religion seeks to maximize faith. But science still rests on some assumptions taken on faith : external object reality exists and has a structure that permits making generalizations and predictions. It’s key strength is the ability to revise beliefs based on new evidence. While the scientific method can never absolutely prove a belief is true, it is excellent at disproving false beliefs using the tools of hypothesis formation and testing. These are learned tools that don’t get exercised in our early formations of beliefs in life (and sometime rarely in adulthood too). Why do we have Beliefs? We are incredible pattern recognition machines, observing and making conclusions about how the world works from birth. 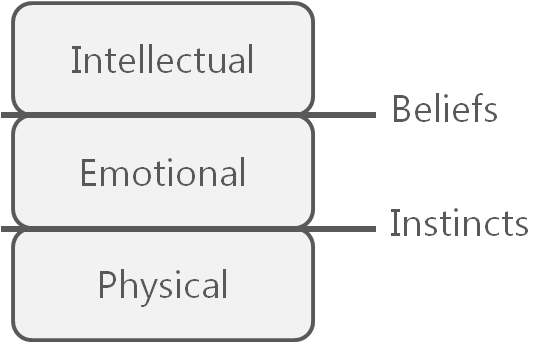 This ability to model the world is critical for our survival and has lead to our increasing ability to hold beliefs. Confirmation bias. We tend to selectively choose evidence supporting a belief and ignore contrary evidence. Disconfirmation bias. We spend significant effort trying to disprove beliefs that are not aligned to existing beliefs.